Adobe Lightroom Print Module allows you to set the print options and page layout for printing your images. As always the module workspace is divided into three main sections with a filmstrip on the bottom. On the left hand side there are Preview, Template Browser and Collections panels. As well as the Page Setup button which calls the printer setup pop-up window when clicked. 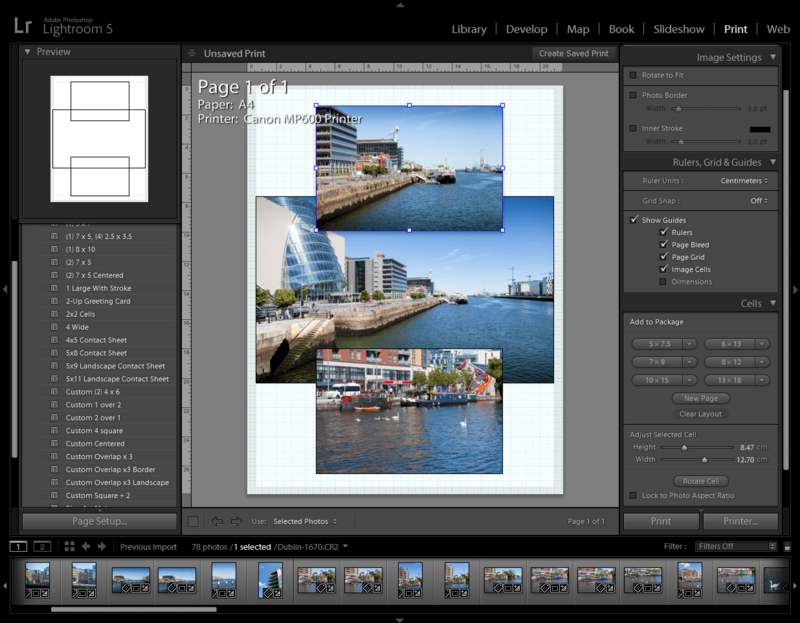 Main workspace window with printing output is located in the middle of the screen, same as in any other Lightroom module. On the right hand side you have all the controls for setting image appearance, resolution, adding text, borders, modifying template and other adjustments. You can use either Grid or Filmstrip mode in the Library module to complete this task. Click the Page Setup button on the bottom of the left hand side panel group. This will bring up a pop-up window where you have to set your preferences. There is a variety of preset templates to choose from. You can use any of those depending on the type of the desired output. Preview panel will give you overall idea of how each template looks like as you click them in the list. You can also modify any chosen template by simply dragging its corners to change size; or by dragging each element to reposition it (guides and rulers are available to help with this task, same as in Photoshop). Custom templates can also be created or imported. There are three main templates types: Single Image/Contact Sheet templates, Picture Package templates and Custom Package templates. Any of them can be altered live to meet your needs. In order to add images to your selected template simply drag and drop them from the Filmstrip into the placeholder element. To remove – click an image and hit the Delete button on your keyboard. This simple process will allow filling in your Lightroom Print module layout. After all the images have been placed and resized for printing; you can add some extra appearance elements. Such as borders, shadows, text, background color and watermarks. All this can be done using the right hand side panels with very intuitive interface. Adobe did real good job on making those user friendly. When all the visual appearance elements are set, you have to do some work in the Print Job panel. This is related to technical part of printing process – set your color management preferences, resolution, whether to use or not Draft Mode printing, 16-bit output (if is supported by your printer), sharpening, brightness and contrast. And that’s about it. This is how you prepare your images for printing using the Adobe Lightroom Print Module. You also may save your settings if you plan to reuse them later for another print job. To do so click the “+” icon in the collections panel and choose the Create Print option. Type a name for it and in Print Options, select Include Selected Photos or Include Referenced Photos. Select Make New Virtual Copies if you wish the output to include virtual copies instead of the original images, click Create. If you would like more detailed explanation of any of the steps taken, please let us know in comments below.